The extent to which I overthink things can get a little ridiculous. Take menu planning for example. My new obsession is using up stuff I already have, but I also go a little nuts about the order of recipes each week. I try to put the easy ones on days I work (a no brainer, right? ), but I also always make each week's vegetarian meal last. I hate the idea of eating meat on Thursday that has been sitting in the fridge since Sunday! Plus, if I am too wiped out from work that day, I can always make a veggie meal a day later. 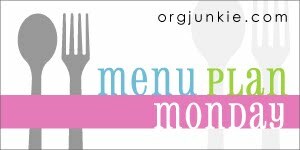 Check out more Menu Plan Monday ideas at Org Junkie. I don't think you are overthinking things... I think it's smart! I always menu plan using the stuff in the fridge first. Hey Madeline. Hope things are well. Have you noticed that the Travel Channel is showing a 1 hour block of $40 a day. M-F definetly, but maybe on the weekends as well. That was always my favorite show of hers. Yay!